Dakota Territory, including present-day North Dakota and South Dakota, held three constitutional conventions before the states of North and South Dakota achieved statehood in 1889. As constitutions were drawn and steps toward statehood were taken, the description of official seals to authenticate official documents had to be addressed. Committees formed at the constitutional conventions were created just for that purpose. 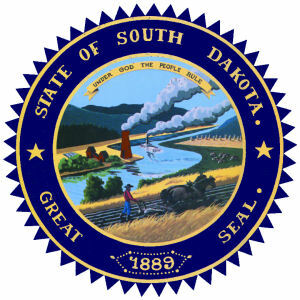 Some have offered evidence that the current description of the South Dakota state seal may have been approved by the Constitutional Convention of 1883 . However, published versions of the 1883 Constitution that we have seen offer a description of the then-current territorial seal. It makes sense to us that the territorial sea would be documented in the 1883 Constitution as North and South Dakota did not formally exist at the time. We believe that the evidence suggesting that the current seal was established at the Constitutional Convention of 1883 is weak. 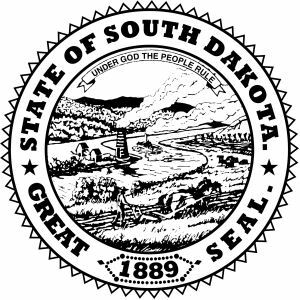 Currently available documentation confirms that the description of the current South Dakota Great Seal was approved by the Constitutional Convention of 1885 with some minor changes made in 1889. In 1885, however, the seal was still considered a “Dakota” seal rather than a “South Dakota” seal. At the Constitutional Convention of 1885 , the Committee on the Great Seal and Coat of Arms was chaired by Dr. Joseph Ward, founder of Yankton College, and it was his committee that offered the 1885 description of the Dakota state seal. The description of the state seal in the 1889 Constitution is virtually identical to the description approved by the Constitutional Convention of 1885 . In addition, two instances of the phrase “State of Dakota” found in the 1885 description were changed to “State of South Dakota” in the 1889 description. The current description of the seal was approved when the people of South Dakota ratified the 1889 Constitution on October 1, 1889. The current Article 21 of the South Dakota Constitution describes the state seal approved by the Constitutional Convention of 1889 at Sioux Falls. Within the inner circle, South Dakota’s motto "Under God the People Rule” is displayed on a banner floating in the sky. A background of sky and hills (the Black Hills) offers a depiction of the state’s natural beauty. A river (the Missouri River) runs through industrial (to the left) and agricultural (to the right) land. A steamboat, representative of trade and transportation, plies the waters of the river. On the left bank of the river, the mining industry is represented by a smelting furnace, hoist house, mill and dump. On the right bank of the river, the state’s agriculture is represented by a farmer plowing a field with a team of horses while cattle graze in the background. Beyond the cattle can be seen a field of corn. The outer circle of the seal bears the words "State of South Dakota", "Great Seal," and the year South Dakota achieved statehood. In 1961, the South Dakota Legislature adopted a “reproduction of the seal, described in article XXI, section 1 of the Constitution of the State of South Dakota” as the official colored seal of the State of South Dakota along with instructions on the preservation of an original seal created by Richard Cropp. The statutes below may seem a bit confusing. Perhaps the confusion can be limited if we remember that the constitution and the statutes are actually describing two different things. The 1961 law describes an “official colored reproduction” of the official state seal described in Article 21 of the Constitution. Further legislation was adopted in 1986 to make it a misdemeanor, punishable by law, for misuse of the state seal or reproductions, to establish a royalty framework for use of the seal or reproductions, and to reinforce the Secretary of State’s position as custodian of the state seal. The official state seal is described in the South Dakota Constitution . The following is excerpted from the South Dakota Constitution , article 21, section 1. § 1. Seal and coat of arms. 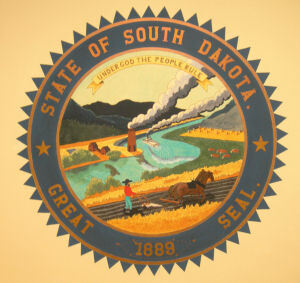 The design of the great seal of South Dakota shall be as follows: A circle within which shall appear in the left foreground a smelting furnace and other features of mining work. In the left background a range of hills. In the right foreground a farmer at his plow. In the right background a herd of cattle and a field of corn. Between the two parts thus described shall appear a river bearing a steamboat. Properly divided between the upper and lower edges of the circle shall appear the legend, "Under God the People Rule" which shall be the motto of the state of South Dakota. Exterior to this circle and within a circumscribed circle shall appear, in the upper part, the words, "State of South Dakota," in the lower part the words, "Great Seal," and the date in Arabic numerals of the year in which the state shall be admitted to the union. The "official colored seal" is described in South Dakota Codified . The following information is excerpted from the South Dakota Codified Laws , title 1, chapter 1-6, sections 1-6-1 - 1-6-3.4. 1-6-1. State seal adopted--Reproductions. There is hereby adopted as the official colored seal of the State of South Dakota, a reproduction of the seal, described in article XXI, section 1 of the Constitution of the State of South Dakota, and made in conformity therewith but whose proportions and colored detail are set out specifically in accord with an original painting of the great seal produced by John G. Moisan of Fort Pierre and shall be the basis for all reproductions of the great seal of the State of South Dakota. Source: SL 1961, ch 291, § 1; SL 1987, ch 2, § 1. 1-6-2. Design of seal and coat of arms. The design of the colored seal of the State of South Dakota shall be as follows: An inner circle, whose diameter shall be five-sevenths of the diameter of the outer circle of any seal produced in conformity herewith; within which inner circle shall appear; in the left foreground on the left bank of a river, a rust-colored smelting furnace from which grey smoke spirals upward and adjacent to which on the left are a rust-colored hoist house and mill, and to the left a grey dump; these three structures being set in a yellow field and above and back of a light green grove on the left bank of the river. In the left background is a series of three ranges of hills, the nearer range being a darker green than the said grove, the intermediate range of a blue-green and the higher range of a blue-black coloration. In the right foreground is a farmer with black hat, red shirt, navy-blue trousers and black boots, holding a black and silver breaking plow, drawn by a matched team of brown horses with a black harness. In the right background and above the horses in a pasture of grey-green, a herd of rust-colored cattle graze in front of a field of yellow-brown corn, part in shock and part in cut rows to the rear and above which are blue and purple hills forming a low background and receding into the distance. Between the right and left foregrounds and backgrounds is a light-blue river merging in the distance into a sky-blue and cloudless sky. Moving upstream on the river is a white steamboat with a single black funnel from which grey smoke spirals upward. Green shrubbery appears on the near bank of the river, in the left foreground and on the right bank of the river near the pasture is a yellow field. The farmer is turning black-brown furrows which reach across the circle and in his foreground is a field of brown-green-yellow. Near the upper edge of the inner circle at the top on a golden quarter circle which is one-fifth in width the distance between the innermost and the outermost circles that compose the seal, shall appear in black, the state motto: "Under God the People Rule." This innermost circle is circumscribed by a golden band one-fourth as wide as the above-described quarter circle, which inner border, shall be circumscribed by a deep blue circle four and one-half times as wide as the above quarter circle, on which in golden letters one-third its width, in height, shall appear at the top the words, "State of South Dakota." In the lower half of the deep blue circle shall appear in words of equal height "Great" and "Seal" between which shall be the numerals "1889." Between the above-stated names and on either side shall appear a golden star one-half in size the width of the deep blue circle. Circumscribing this deep blue circle shall be a band of gold of the same width as of the inner golden band. Outside of this outer golden band shall be a serrated or saw-toothed edge of small triangles whose base shall be of the same width as the above quarter circle. Source: SL 1961, ch 291, § 1. 1-6-3. Preservation of original seal. The original seal as produced by Richard Cropp of Mitchell shall be kept in a container sealed against sunlight and housed in a location to be determined by the secretary of state. Source: SL 1961, ch 291, § 2; SL 1987, ch 2, § 2. 1-6-3.1. Use of seal, facsimile, commemorative medallion design or bullion piece design without authorization prohibited--Violation as misdemeanor. No person may reproduce, duplicate, or otherwise use the official seal of the State of South Dakota, or its facsimile, adopted and described in §§ 1-6-1 and 1-6-2, or the state commemorative medallion design or the state bullion piece design adopted by the commissioner of administration for any for-profit, commercial purpose without specific authorization from the commissioner of the Bureau of Administration. A violation of this section is a Class 1 misdemeanor. Source: SL 1986, ch 8, § 1; SL 1987, ch 3, § 1; SL 1988, ch 5, § 1. 1-6-3.2. Sale of seal facsimile, commemorative medallion design or bullion piece design without authorization prohibited--Violation as misdemeanor. No person may sell or offer for sale a replica or facsimile of the official seal of the State of South Dakota, adopted and described in §§ 1-6-1 and 1-6-2, or the state commemorative medallion design or the state bullion piece design adopted by the commissioner of administration without the specific authorization from the commissioner of the Bureau of Administration. A violation of this section is a Class 1 misdemeanor. Source: SL 1986, ch 8, § 3; SL 1987, ch 3, § 2; SL 1988, ch 5, § 2. 1-6-3.3. Royalty for use of seal, commemorative medallion design or bullion piece design--Educational purposes excepted--Deposit of fee. The Bureau of Administration shall charge a royalty for the privilege of using the seal, the state commemorative medallion design, or the state bullion piece design. The Bureau of Administration may not charge a royalty if the state seal, the state commemorative medallion design, or the state bullion piece design is used for an educational purpose. The royalty fee collected for the use of the state commemorative medallion design shall be deposited in the commemorative coin fund provided for in § 1-6-23. All other royalty fees collected pursuant to this chapter shall be deposited in the state general fund. Source: SL 1986, ch 8, § 2; SL 1987, ch 3, § 3; SL 1988, ch 5, § 3; SL 2006, ch 2, § 1. 1-6-3.4. Secretary as custodian of seal. Notwithstanding the provisions of §§ 1-6-3.1 to 1-6-3.3, inclusive, the secretary of state shall continue as the custodian of the state seal pursuant to § 1-8-2. Source: SL 1986, ch 8, § 4. South Dakota Constitutional Convention: Held at Sioux Falls July 1889 . Vol. 2. Huron, S.D. : Huronite printing Co., 1907. Print. Shearer, Benjamin F. and Barbara S. State Names, Seals, seals and Symbols: A Historical Guide Third Edition, Revised and Expanded . Westport, Conn: Greenwood Press, 3 Sub edition, 2001. History of the South Dakota State Flag: State flag descriptions begin with the state seal. State of South Dakota. State seals: Complete list of official state seals from NETSTATE.COM. More South Dakota symbols & emblems: Complete list of official South Dakota state symbols from NETSTATE.COM. South Dakota - 3" Round State Seal Patch , 3" round patches feature an emroidered version of the state seal of South Dakota. Iron it on or sew it on. US Sights and Symbols: Seals , by Annalisse Bekkering. 48 pages. Weigl Publishers (August 2009) Reading level: Grade 4. What do official sites and symbols reveal about each of the states? How do state emblems honor and uphold the heritage, culture, and resources of the country? The U.S. Sites and Symbols series provides fascinating facts about each state’s incredible sites and symbols. Stunning color photographs showcase these American icons. Every book in the series builds an understanding of our nation through the history of each state’s official symbol. This engaging series reinforces citizenship, community, and national pride. Great State Seals of the United States , by Annemarie Berg. 158 pages. Publisher: Dodd, Mead and Company (October 1979) Reading level: Young adult. Discusses the design, adoption, and use of the Great Seals of the 50 states.